Dead by catch allegedly left behind at Jimmys Beach, NSW, by commercial beach haulers. 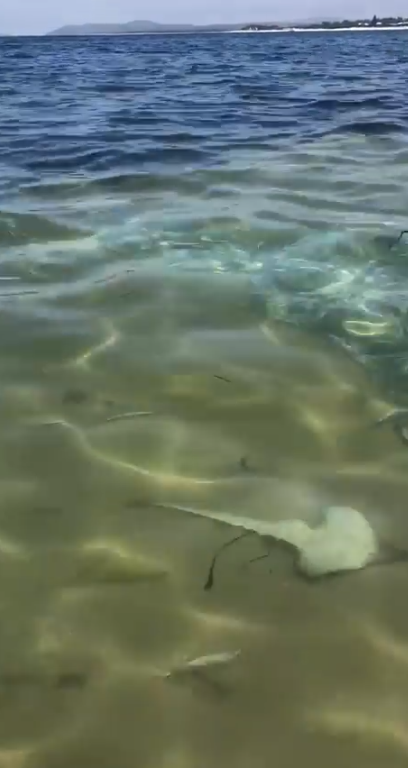 THIS year started with another horror story showing hundreds of fish and rays dumped by beach haulers targeting whiting at NSW’s Jimmy’s Beach. It featured in our News section and received lots of coverage in the Newcastle Herald. There were videos and photographs from outraged locals and claims that the perpetrators were known and could be identified. DPI / Fisheries claimed it lacked enough evidence to mount a prosecution. It’s a sadly familiar story. At around the same time on a south coast beach I again watched beach haulers targeting whiting and bream right in the middle of the holiday season, when visitors pay a small fortune to stay and hopefully catch a few fish. They operate right next to a marine park sanctuary zone. For years I’ve watched pelicans dine on “released” undersized or unwanted by-catch after the operators leave and tried to flip half-dead rays back into the water. I’m told that when this marine park was established the last two beach hauling licences there could have been bought out for $500,000, but the government baulked at the cost. One at least has been transferred to a new operator since that time. My mind goes back to an interview with Ian Macdonald, at the time the new Fisheries minister, when he told me and a colleague that “the pendulum has swung too far towards recreational fishers, and I’m swinging it back to commercial”, which he did. He also abolished the Advisory Council on Fisheries Conservation and wrapped the Advisory Council on Aquaculture into his new Seafood Industry Council and reneged on an undertaking to complete a Fisheries Management strategy for recreational fishing. He’s currently doing time in the NSW prison system. But I digress slightly. How about this for a plan, current Fisheries minister and alternatively shadow Fisheries minister? Commit to use some of OUR recreational fishing licence fees currently spent on administration and questionable compliance activities to buy-out NSW’s remaining beach hauling licences. No ifs-and-buts about how hard it will be, just determine fair compensation amounts for the remaining operators…. enough for them to retire or start new businesses……and get on with it. Ignore the excuses that you’ll hear from your senior fisheries managers…. they’ve put the same old risk-aversive reasons not to do it to their ministers for years. Make beach fishing in NSW great again. Give local bait-and-tackle shops, accommodation providers, fuel and provision sellers a real kick along. Don’t take any notice of the tired old “right of NSW consumers to eat local fish” arguments. If people really want to eat local beach-sourced fish, they can catch it themselves. Or order sustainably harvested line-caught fish. At any rate, most coastal fish-and-chips fish is NZ hoki, clubs specialise in Vietnamese basa or NZ snapper, and restaurants offer NT or overseas barra. So how about it, Coalition or Labor? Give us 800,000 or so NSW rec fishers something meaningful to consider before we cast our votes in March.